Do we buy propellers or is there another file for those? You'll have to buy propellers for it. Hello, I've really been wanting to 3d print and build a drone, this one is the best design I've found, although the are a little confusing, lots of them take you to, "Page Not Found," (I think many of those products have been discontinued). But is there an all-in-one sort of thing? Thank you for the help. awesome, simple and simply awesome. Updated site link for in instructions. I know it's been posted below, just refreshing it so the link is easy to access. Hi, can i use PLA for print it? Resource limit reached. Can't access site. Here is a working link. Can I not just connect the camera to the main battery rather than have two batteries? but i am new to drones and all and this is my first drone..
can u please suggest me some website to learn how to connect and configure the transmitter and the receiver..
i mean how to get on with flying the drone after i have built it? Hello, nice micro quadcopter, it looks aesthetically pleasing. I am thinking of making one myself, and was wondering how long is the battery life? this version is for 6mm motors? Could you share the CAD files in another format? I am wondering if this will fly without the camera and related items such as the second battery. I would like to test a more basic version before investing in the video equipment. Hello, I do not see any thing about the other parts. Where can I look for them? Like camera or the board? I can find them if you name them. Follow the link in the description! Can someone help me with this problem, the cross (x) bar is disappearing when I go to print on my Flashforge Dreamer. When I use the native Flashforge printing software (FlashPrint) to open the frame.stl an error comes out "Error has occured to the model. You can (1) Repair model (2) Delete model or (3) Ignore. Selecting anything but (1), does not allow printing. Selecting (1) I get no cross bar, it disappears upon repair.I only found this out after printing a couple of times. I have tried loading the frame.stl into Simplify3d and printing. The same thing is happening. I have downloaded the file multiple times to try to correct this problem. So far no luck. Did you ever get this resolved? I have printed this frame, but the x-bar does not print. It shows in the download, but when I export it to file the x-bar does not show. No, I did not fine a solution to get the x-bar to print. I have gotten some of the other micro frames in Thingiverse to print. This one just doesn't want to print with my combination of hardware and software. My biggest problem now is the electronics. I burned out the scisky flight controller during soldering or wire connection step. Now I am waiting for a new scisky flight controller to arrive. what parts do you need to buy? and from where? also, what remote do you use? Does this frame work with the components of the micro drone 2.0? The plastic core of mine has cracked and would love to transfer the electronics over to this frame. Hi men can you show me a page where I can buy the perfects motors and cpu? So if I buy this:http://www.banggood.com/Wholesale-Http--or-or-www_banggood_com-or-Wholesale-Udi-U816A-2_4Ghz-4-Channel-6-Axis-RC-Quadcopter-Dexterous-Mini-UFO-RTF-p-52318_html-p-52318.html?p=EM0306363706201312DW , what other parts do I still need to purchase to put this all together? If you're not doing FPV (First Person View flight) aka view from camera wirelessly then this set is just enough to get your 3d printing project running. Can you make a version for 8.5mm motors and camera pointing more the sky? Thank you. And the 8.5mm motors are on the way? :) thank you! This project is fantastic. I have been time looking for drone to build and show to my students. I have a question. Is possible with the hardware that you describe control the drone with a phone?? Is there specific recommended parts, the link has lots to choose from. Would someone be able to tell me what parts would be best. I dont have a large budget. How much did it cost you to make yours? By today pricing it should be now down to USD$75 per-build....the cheapest at least. Nope, the motor are too small to fit inside the frame. Not sure if it could lift up the overall load of the build. Cheers I've printed the frame already and now awaiting a ladybug 939V to arrive. Thanks for your build its brilliant! Has anyone built this with a flight board that's compatible with Spectrum radios? If so, what board did you use? I don't really care about the FPV part, I just like the size and look of this little quad. I would love to build this, but I don't see a point in buying a new transmitter. last question...maybe. Any propellers here on thingverse you recommend to print? Not recommended to print any propellers on this quad size, too brittle and too much printing ripples on the blade surface. I use micro tweezers or sharp narrow pliers to remove the support. What parts on the part list on http://www.supermotoxl.com/Real-object-design-for-hobby-models/3D-printed-real-object-design-for-hobby-models/xl-rcm-100-pixxy-pocket-dronefpv-quad/menu-id-118.html did you use in your model? You'll require to remove bulky plug and direct re-soldering wires to the board to make overall assembly thin and compact. What video and camera parts did you use? I'm really wanting to do this but am wondering what the advantage is vs just attaching a FPV system to the quad that you linked to? Don't get me wrong, the frame is still printing next to me but I'm just curious. I read some of your other comments about there being some build video but I can't find it on the parts page or linked anywhere else. Please link me in their direction! Finally, I'm sure there are but any videos in flight? HD Camera a possibility? 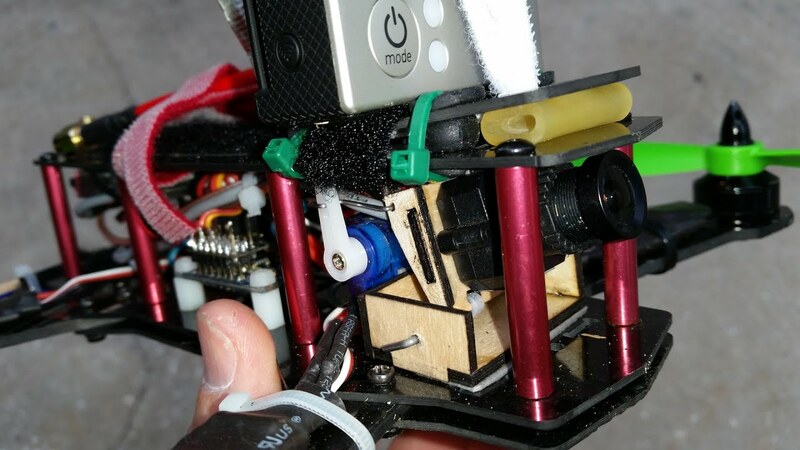 With FPV mounted you can fly remotely from first person view, disadvantages is you'll get extra grams of heaviness. Build videos? ...hhmmm usually i put them into galleries for clearer view. However next micro 3d printed micro quad have time-lapse video build. This quad cannot carry HD camera, its too small to carry even market smallest HD camera. I do have flight videos, let me check my archive inventory later which previous print shots. Cool that'd be great. Any words about the blade nano, Estes Proto-X or SYMA 11x for donors? The four arms that hold the propellers on the frame droop down when I try to print it, and the result is a mess of filament. I am printing with the replicator mini and the regular PLA filament. Should either of those change? Not sure on replicator mini but on UPS printer 'support' option must be enabled. I was wondering if these parts from this Rc-quadcopter: http://www.banggood.com/New-Version-Upgraded-Hubsan-X4-V2-H107L-2_4G-4CH-RC-Quadcopter-RTF-p-71838.html would work on the the printed version. It will fit assume the motor diameter not changed. The tabs at four corners of cover do not print attached. This is not an adheasion or printer problem. Anyone else having problem with stl's? Sliced with makerware and slic3r printing on a ff creator x pro. If you have having trouble slicing 3dxl's Pocket drone, fear no longer! After doing so I was not only given pristine stl files that could be fed into my slicer with precision and accuracy but I was given my youth and lots of riches. Hi, want to print it for my father, is it difficult to build? Also, without FPV, how much does it costs (cheapest parts)? Thank you! You'll need soldering skills. Without FPV overall parts will cost your below $40 depending on which online seller you get the parts from.. Cool, so when did we ever had agreement to commercialized it? Hi i was wondering if you could make one of these drones and sell it? If I were to use this: http://www.banggood.com/Boscam-FPV-5_8G-200mW-Wireless-Audio-Video-Transmitter-Module-TX5823-p-84780.html?p=EM0306363706201312DW transmitter for FPV what would I need to buy/make for the antenna? You don't need to make because the video transmitter module should include the antenna by default. If you don't have it try to contact the seller The antenna is very small. That's very unusual, usually i always got my antenna but it always scattered inside the box and lost it. Did you check properly? Its a small black thin antenna. Btw else i'll post the measurement when i get back home later. I'm outside right now. My vTx was just in a sealed bag...no antenna :/ actually I may have a spare cloverleaf lying around that I might try to solder on it, however if not I would still appreciate length and what wire you used. Thanks! Video please, I want to make but not understand english verry well. I'm not going through whole length rebuilding again, however there loads of "build in progress" photo showing how it is assembled and soldered. The control board I bought from your link has "plug in spots" on the board, but the motors I bought have just bare ends. Any advice? Usually you'll need to direct solder everything on board. Remove the "plug in spot" by de-soldering out the pins. Then direct solder the motor wires to its respective spot/terminal on board. This should remove some weight and keeping the board compact fit inside the frame. Hello, amazing work on this drone! I want to make it printed via an online 3D printing service, when importing the .stl files should I select millimetres or inches? Thanks! How much would this cost to make for a begginer? so the total cost for the initial(FPV setup was only $20-$30 for me. The nano transmitter costs around $50 and camera for it should cost between $40-$60. However if you add the FPV setup the 250 mAh battery included above(it actually comes with 2) might be a little bit to small to give you any real flight time with the extra power consumption. So, finding a battery larger than 250 mAh and smaller than 350 mAh(just a guess at the cameras weight limits) would probably be another $10-$20. So if you are patient and spend enough time hunting down the lowest prices on these parts you could probably build the whole thing for around $110-$120 if you are lucky. PS: if you buy the quad in the link above you have to rotate the flight board 45 degrees in the frame, which is a bit tough to do, but it won't flight without it. Also, you may have trouble connecting quad to controller: do this buy plugging battery into quad, turning remote on, then put the quad on a level surface(make sure the print is not warped or you will have to adjust so that the props are what are level), then push the the throttle up and down on the remote until it beeps and they are connected. What do you mean by, "rotate the flight board 45 degrees in the frame."? Do you mind posting pictures of what you mean, or describing it in further detail? So on the one I bought off of amazon, it is oriented in the way that an arm is protruding outwards perpendicularly from the middle of each side of the flightboard, and must be oriented in that way to fly. The design of the print is made for the flight board and arms to be oriented so that the arms protrude outwards from the corners of the flightboard. This does not seem like a big deal but it must be oriented correctly to fly because it is the way the board is calibrated, so, if you mounted it to the prints intended directions, when it dips forward, a whole side of the board is dipping forwards, vs the way it is calibrated, assuming that only a corner would dip forward. So, if mounted to the design's intended orientations, when the board dips exactly forward; which I'll call north, in flight, the board "thinks" it is dipping exactly Northeast, or 45 degrees to the right in flight, and tries to level accordingly. This makes it unflyable. Luckily I've found that with some pressure, a bit of carving and sanding, you can fit the whole board from amazon below its designated area, oriented correctly. However this does not make it very exact, and even if you do managed to wedge it in at precisely 45 degrees off, any bumps may push it out. Modifying the file is something I have yet to get around to but may sooner or later. I hope this helped! I edited the frame to match what you said. Please tell me if I did it correctly. Very nice! There are a few little issues on the mounts between the arms and body that I'll try to repair! Thanks a bunch! The cost may varies depending which vendor and parts of choice used. I receive reports that one of the builder manage to build Pixxy with full FPV gear at USD130 for full live view FPV flight complete with DIY LCD screen display gear. At the bottom of the above page listed some of the electronic component that are required to build. You can hand pick which is the best for your budget and performance. OK guys i just updated new item/hardware resources that fit PIXXY kit last night and also included some lists of compatible Pilot FPV gear for wireless visual hardware/ground station build. Enjoy your very own FPV/drone flight. I'll update the shopping cart at my website later tonite to find alternative hardware resources for PiXXY. Give me some time. Hey guys i've added the circuity diagram here (gallery attachment) and on my website for those curious how FPV circuit works. Very simple and pretty basic/generic for overall FPV hardware installation. I'll be updating some more for my planes/drone too. I bought and used this amazon.com/gp/product/B0095BXACK/ref=as_li_tl?ie=UTF8&camp=1789&creative=9325&creativeASIN=B0095BXACK&linkCode=as2&tag=krisk-20&linkId=ZEYLR7QXAFM7QAN6 and I cannot get it to fly. Once I've made sure I have all the motors in the right spots but when I start it it will shoot off and go crazy I'm not sure where I've gone wrong. Any suggestions? Make sure the flight controller board are properly seated and free from vibration, the small board have gyros that are sensitive to vibration that causes it unstable. However if it spins/swirl around then you maybe have either the propellers or motors rotate in reverse direction. I have repeatedly check the motors and props, but I have not properly secured the flight board, thanks for the help! Three questions: Is hot glue connecting the flight board to the frame in 8 spots a good enough securing to keep the gyros stable? Also if one propellor is loose and frequently falls off could that cause it to not fly? Could the loose prop not be rotating as fast as the motor because it is loose and doesnt catch on the motor as much? Small dab of hot glue in each four size is good but just watch out with the weight. If the propeller "pitch" size was not right for the motor you will not get enough lift. Did you bought the propellers match recommended with motor specification? Hi , i wrote you a message. I just would like to ask you, how much it will cost if you sold it to me? Thanks. Sorry i don't sell stuff or commercial things because this is hobby for fun. I only can help to guide and give tips so you can make your own quads. I think its not that hard to build if you follow provided reference links from multirotor/quad forum. I would appreciate that. I have the all the parts minus the video components on their way and am going to build this. I love your ideas and designs on your website. Thanks for posting this. I am new to the 3D printer and building of quadcopters, but you've really got my interest as well as a co workers very peaked. If this one goes well I am going to gather some parts and assemble another from scratch from the HobbyKing site. Btw if anyone send me a personal message previously do take note i can't reply your PM because i can't see any messaging/PM feature in my account other than in my email replied by thingiverse reply bot. Please post it in here. Thanks. How do you link up the transmitter from the UAV to your remote? How do you do the camera data transfer? also: what is the best(preferably cheapest) fpv set up(including screen) you have found for this? Nope you can't strapped Mobius and neither 808 #16 HD cam, both too heavy. Tolerable extra weight it carry is around 10 gram, just the FPV equipment itself. Find a 5~9 gram camera instead. The cheapest already mentioned as discussed below. Normal LCD analog signal type screen should be USD$19 at car accessories shop (the one used for reverse viewing LCD screen inside the car). Print time on replicator 2? I re printed this (Makerbot Replicator 5th gen) after I flipped it in tinkercad and turned on the supports and after some plier work, have a great frame. Have flight components ordered and will get camera components later. Looking forward to building this! Cool design! I have access to printers through my university but they only print in PLA plastic. Do you think there's any chance I could print this on PLA? Yes you can print it in PLA. What slicer and settings has everyone used for this model? The Hubsan X4 seems to use the same motors. Would the rest fit in? For the motor i'm sure it could fit in easily, for the X4 main electronics boards i'm not sure about that. For under 30$ you have a hd drone. Hello! I am new. I wish to know what is the best 3d printer kind to print this thing and rc cars and guitars? Maybe one of these? http://www.hongkiat.com/blog/affordable-3d-printer/ which would be the best to print this thing? thanks! I don't want to be bias with other printer but If you want a simple "click and print" i think "PP3DP UP2" 3d printer ( http://www.pp3dp.com/index.php?page=shop.product_details&flypage=flypage.tpl&product_id=10&category_id=1&option=com_virtuemart&Itemid=37 ) is an alternate choice without too much thinking how to operate or learn extra step to "model slicing" before printing. My "PP3DP UP1" can print broken/cracked/faulty 3D models. Printing 3D models from gaming meshes works great with UP1/UP2. For other 3D printing models you'll need to use a "Slicer" before printing. Can you please tell me the total cost of all components for this pocket drone (so excluding the 3D printed parts)? The cost is (V939 combo quad with radio Ready To Fly = $38) + (5.8ghz nano 200mw/10mw video receiver = $19) + (Nano 520TVL CMOS camera = $18) + (1s 100~200mah lipo battery for video powering = $3) + (5.8ghz wireless video receiver = $29). TOTAL: USD$107. Just hook to your analog TV monitor/analog car LCD and your ready to fly wireless video live. Btw the cost mentioned are close to estimated/average market price without shipping. You can find more cheaper alternative online from China or Hong Kong warehouse. My friend build it under $85 for everything. Thnx a lot for the detailed sharing of costs for all parts/components! Is there a light weigth prop guard for this thing? Nope, then need to self fabricate. Is the .z3d file available? Other site shows only *.3ds file, while showing the ZModeler app. Inside Z-modeler, click "Import" and select *.3DS filter to open it. That UDI also is a perfect match, Thanks Kriskitchen. Caution, this camera is cloned version. Be sure to get this model type: "808 #16 HD keychain"
I wanted to ask, if I understand right, I can just buy WL V939 as complete thing, and just transfer the parts to your frame adding the camera with video transimmter? If so, it will be a really comfortable for me, as long as I can buy most of the parts in one. I have question to you. I have the Udi816, but its a bit unstable because of its small dimensions. So is it possible to build your bigger one "Mini FPV quad copter kit for V929 or HK Q-bot" out of the syma x5c? Im asking about the syma, because I can buy it cheap from someone near me. So now i need to buy also the camera, video transmitter, battery for them and some video receiver. Am I right? Oh, and what video receiver will be suitable for this setup? Theres no way to put inside anny better camera? Nope, it too big to fit inside this quad frame. Very bulky. Great Project, but to be perfect as project, all must be printed, propellers, etc. Can this be done today with our printers? Search for propellers on thingiverse, short answer, yes. Great project and material, btw. Really appreciate the detail. I thought they would too, but I bought from banggood and they didn't include any antenna. Is it possible to make them from coax cables? Or, should I order from digikey etc? BG should include it seriously. how thin does the copper wire need to be? I am planning on ordering the 200 mW Transmitter and it looks like it may not come with an antenna? Question, what do you use to receive the video transmission? Is it possible to use a camera with better resolution (HD if possible)? And if so which, for example? for the "extractable hardware" do you really have to buy a fully functional drone already? because thats where the link takes me. -"Ready to Fly version direct extractable hardware for 100% fittings: "WL-TOY V939 RTF" <-----that link. takes me to a lady bug drone. i was wondering if i could buy that else where or at least explain why i'm buying a drone premade to make a drone..
thebildo9000: You dont have to buy as whole, this is optional choice for those who doesn't understand how whole component works. You can always handpick your own selection from variable sources. Yes you can but not always 100% perfect since propellers this small needs perfect smooth surfaces. ABS material would be too fragile for a small prop. can u update your shopping list. some of the parts are not available anymore to purchase on the website. valmanza83, thanks for the notice. I'll check and update the missing shopping list. See if i could find a matching or compatible electronic replacement that fit this quad. Cheers. Its 1/1 scale plam size. Just print straight from STL default sizing. Its 520TVL nano CMOS cam. You can find inside the links above description. I am looking to build one of these but I am new to rc electronics. How did you make your antennas (what length are they)? I am also interested in building this quadcopter but I dont know how to build or where to buy the antennas. See if someone helps us .. Try "netfabb" to slice it, my print always 100% works unless you have different setting. Even after fixing with NetFabb, there are gaps and incomplete layers all over the place. There is no way this would print very well. I guess I'll give the 3DS Max files a lookover. What kind of flight time are you getting with this? Shadii, got me 6~7 minutes of flight time with constant fowards flight on 300mah 1s lipo. What kind of hardware would I need to be able to lift a GoPro3 with this size quadrocopter, if possible? Or are the parts in the instructions capable enough? EddyBorja, it is impossible to lift a GoPro3 because the quad is self is smaller than a GoPro and lighter than that. Hi - can you fix the cover.stl? When sliced in Makerware, the 4 corners are detached :( Thanks! Pcenginefx: You can try "netfabb basic" to tune to the STL preference to match your printer because i don't see any problem printing on my pp3dp and my buddies makerbot. Ok, I brought the cover.stl into Autodesk 3D Print Utility as it has an auto-fix feature for STL models. It had to perform 41 repairs on the part (what the repairs were, it won't tell me sadly). I re-saved the STL, re-imported back into Makerware, and it appears fixed now (screenshot: http://1drv.ms/1g4H0KQ)http://1drv.ms/1g4H0KQ). Glad to hear it works for you. I'll be releases another new smaller kit. Hopefully won't have problem for your next 3d printing. Hey looks sweet. Could you also post the design file so that we can alter the design. The stl is really hard to alter (at least it seems that way for me). GWP17, sure i can post a raw .3ds file for customer user free modification if you like. Let me know if this is ok. I'll post the 3ds format at my website. That would be perfectly fine. I appreciate the help. Hi GWP17, i've uploaded *.3DS file for download at my website so you can alter and do some modification to the meshes. Enjoy. This is SO COOL! But is there any step-by-step assembly/soldering instructions for this? I can buy all of the pieces, but where do I solder all the wires to? I have a gallery page where you can click and see how it was solder based on pictorial images. Btw i've listed shopping lists of parts to build those than include less soldering option. I looked at your gallery, but maybe I didn't look hard enough - will check it out again - thanks! XL-RCM 10.0 PIXXY: Pocket drone / FPV quad by 3dxl is licensed under the Creative Commons - Attribution - Share Alike license.